Coming to you on a Friday because I forgot what day of the week it was (in my defence, I haven’t had a proper weekly schedule in months), we’re continuing improv month with a look at it from the new GM’s perspective. And especially for those starting out, improv is hard. Jim has already outlined an intro to improv that has great tips for integrating improv into your games but is far easier said than done. When you are first starting out, it can be difficult enough to keep track of the the rules, the setting, the characters, the monsters, etc, etc. Not to mention the players will be pushing you and testing you, whether they intend to or not. You have put in so much time trying to plan out your campaign and then something unexpected comes up. Rather than thinking of the improv tips Jim outlines, you’re thinking “oh no!”This is the biggest obstacle to overcome, the rest is just fine tuning. 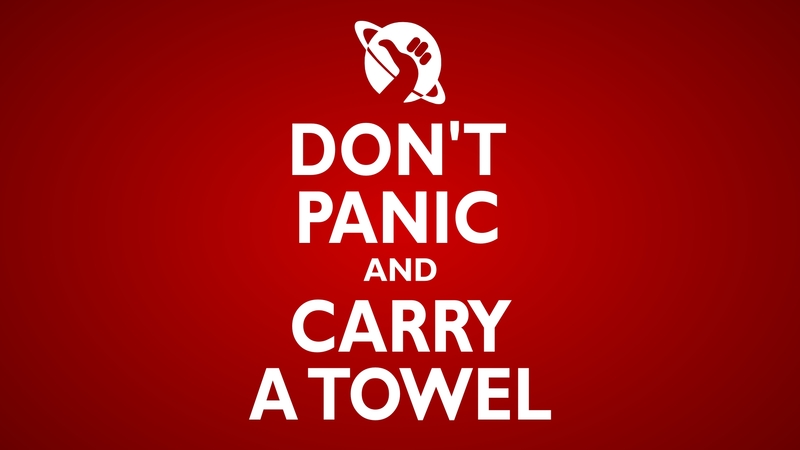 Look to the Hitchhiker’s Guide: Don’t Panic and Carry a Towel. Your first reaction to needing improv is that you failed somehow as a GM. This is not the case. Occasionally it means that there was some part of your adventure that you did not plan out ahead of time that you should have. It happens, simply learn from it and make sure you plan that aspect of your next adventure. More likely, however, is that the adventure went somewhere completely unexpected. With Jim as one of my players, there is very little chance of me predicting where the party will go. Here’s a good example from my own game. During my first adventure they somehow started a goblin revolution, propping up a lowly foot soldier as the spiritual leader supporting the new warlord, leading them out of the city they had occupied and towards a source of greater evil. He even got a wolf pup ably played by my new puppy. There was possible way that I could predict that. 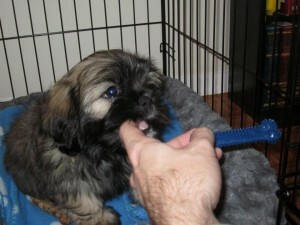 I had a lot of improvisation to do for that story and it was the best part of the group’s first outing. Did I panic? Honestly, a little, yeah. I had no idea what I was doing but it went well anyway. When your party does something crazy, just roll with it. Make it part of the adventure. Getting rid of those goblins lead to greater possibilities for the group and may lead to bigger dangers down the line (but don’t tell them that). 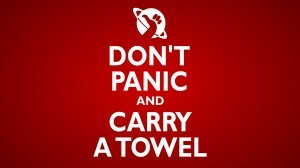 Okay, this is where the analogy breaks down a little but towel here means preparation. The more you know about your world, the better you can make up things that fit within it. Obviously this is harder for a new GM than it is for the experienced one. You need to live in the world for a while before it becomes easy to put believable things back into it. If you develop some things ahead of time, you can have a better feel for your setting. Planning ahead is ironically enough,one of your best improv tools. Going back to the goblins, I had already planned out some adventures centred around a fallen comet that had landed a century before creating a deep gash in the land nearby. This left a perfect location for the goblin army to march towards, searching for more power. It was far easier to throw in that option when I already had that planned out. Will it still be hard? You bet. There is no getting around that but the more you do it, the easier it becomes. And since GMing is a lot like herding kittens through a tinsel factory, there will always be plenty of opportunities to practice. You’ll never be able to cover everything that your group wants to do so plan for what you can and look to our tips the rest of the month for the rest. Yep, the best improvisers know /a lot/. The prep improvising DMs (or as I think of them, “DMs”) needn’t involve maps or monsters, but should involve reading and watching and thinking about what you read and watch. It’s like you’re on a miiossn to save me time and money! I love this post!! I'm just listening to " I am a Mother" by Jane Clayson Johnson and your post fits right into that. Thanks for reminding us about what we should really be doing.